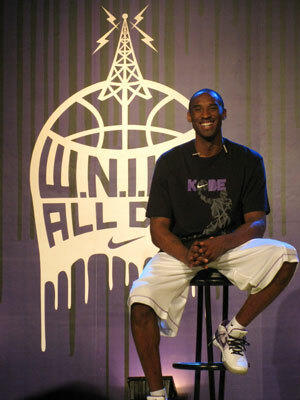 NBA champion Kobe Bryant, together with Nike, kicked off his 2009 Asia Tour at Nike Park, The Fort, today, July 21, 2009. The Philippines is the first stop in his hotly anticipated return to Asia since the Beijing Olympics, where he came out as a champion. After his stay in Manila, Kobe is set to visit five other cities including Singapore, Taipei, Hong Kong, Shanghai, and Chengdu. During the press conference held at the Manila Peninsula today, journalists fielded a lot of questions about Kobe’s dream season of 2009 and how they plan to go about in defending their crown. When asked if another Lakers dynasty were indeed looming, Kobe was confident: “I think we have the talent to do it, to win championships in a row. But you have to have a little bit of luck. About luck I mean, guys staying healthy, or not having serious injuries.” And if lady luck should smile on them, then a repeat championship is definitely not unlikely. With four championships under his belt, comparisons to Michael Jordan were once again brought up. But one thing that Kobe thinks he did more than Mike was to become more of a playmaker for the team. Some people might argue with this, but with his 2009 Asian Tour, one thing’s for sure: He’s ready to facilitate and inspire youngsters in the basketball camps he’ll be holding across Asia. At the kick-off event at The Fort, he would have already touched lives of young dreamers from several Gawad Kalinga communities.